Animatronic bands playing to pre-recorded background music are Chuck-E-Cheesy. Compressorhead, in contrast, slays it. We don’t know if it’s the fact that they’re actually playing real instruments “live” or if it’s just that the folks behind the scenes are really brilliant MIDI programmers, but Compressorhead sounds really good. What’s more, they look really good. 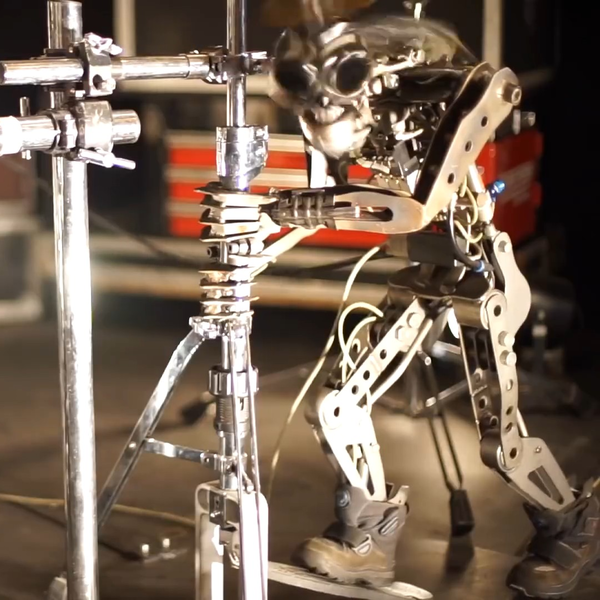 Dig the mini-me version of the drummer robot that’s headbanging and stomping on the hi-hat pedal with his little robot feet wearing actual boots and a gas mask. His mohawk is made of valve-lifters. No further questions, your honor. The bass player bot’s bobbing head and the way he leans forward from time to time is uncanny. And the guitarist has a limited variety of moves besides bobbing his head, but makes up for being immobile by having 78 fingers on his fretting hand. If you can’t get enough Compressorhead, visit their regular website and check out this hour-long concert they played last year in Moscow. By the end, you’ll probably agree that are the most amazing music bots you’ve seen, and that they desperately need a lead singer to tie the whole thing together. We’re hoping that the bot has at least a bit more stage presence than Courtey Love. its funny seeing what they would actually look like when they get here. All it needs is a Markov chain to generate the texts. Is this going to be an animatronic puppet with a speaker, or are they going to build some kind of mechanical voice box? I think that a chunk of moldy cheese would have more stage presence than Courtney Love. Was she actually asleep while singing? They need a Sound Engineer bot, a Manager Bot and some Roadie bots and then the guy can just rage quit the band and they can go on without him and get signed to a major label. Not to mention a groupie bot, e.g. your previous comment to Misthiocracy. What about the WABOT for keyboardist? Is the most amazing robot musician EVER, and it’s over 30 years old! Past futures always look so “futuristic” somehow. If you know what I mean.